Whereas Miami forward Shane Battier has exhibited some hot three-point shooting this postseason (which he extended by going 2-of-2 behind the arc in Game 3 of the finals), the team as a whole has stepped up its free-throw success rate. 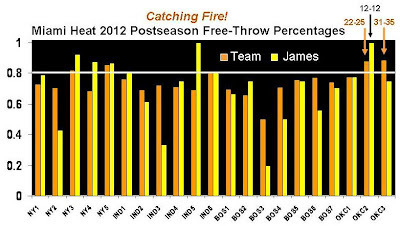 The following chart shows the Heat's free-throw shooting percentages -- and those of its offensive stalwart LeBron James -- in each of Miami's 2012 postseason games (you may click on the graphic to enlarge it). In the two most recent final-round games against the Thunder (labeled as OKC 2 and OKC 3 on the horizontal axis), Miami has registered free-throw shooting percentages of .880 (22-of-25) and .886 (31-of-35). 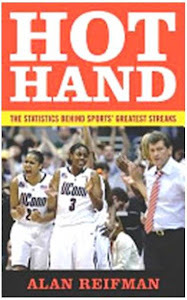 Not since its series-clinching Game-6 win over Indiana in the second round had the Heat hit from the stripe at a .800 clip (indicated by the white line in the graph). In none of the seven games of the Eastern Conference finals vs. Boston did Miami make 80% of its free throws, nor did it happen in Game 1 against Oklahoma City. The Heat did accomplish the feat twice in the first round against New York (Game 3 and Game 5). James has been a major part of Miami's free-throw renaissance, going a perfect 12-for-12 in Game 2 vs. OKC, in addition to nights of 7-of-9 in Game 1 and 6-of-8 in Game 3. Overall for the championship round, James is 25-for-29 (.862). Perhaps the combination of the importance of the finals and the tightness of the games has prompted James to concentrate better on free throws. In three of the Heat's earlier playoff games, he made fewer than half of his shots from the stripe (3-of-7 in Game 2 against the Knicks; 1-of-3 in Game 3 vs. the Pacers; and 1-of-5 in the third game of the Boston series). During the regular season, Miami's team free-throw percentage was .775. For the playoffs as a whole thus far (21 games), it's even worse, .741. Can the Heat sustain its recent 88% free-throw success in the remaining games of the finals?